ELECTRIC 12 STRING GUITAR. MEDIUM GAUGE. 10 - 48. 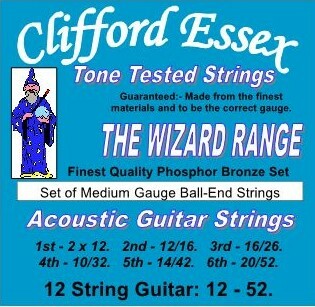 THE WIZARD RANGE - Acoustic Guitar Strings. Made of the finest phosphor bronze on a hex steel core. Generating a very powerful tone with superb brilliance. 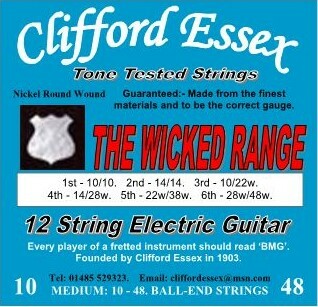 Clifford Essex Strings - The Professional's Choice. THE WICKED RANGE - Electric Guitar Strings. which lasts a lot longer than most strings. ACOUSTIC 12 STRING GUITAR. MEDIUM GAUGE. 12 - 52. ELECTRIC 12 STRING GUITAR. LIGHT GAUGE. 9 - 46.